Your First Holy Communion heart locket necklace may be a gift from a parent or godparent. You might be asked to choose which locket you want for this special event, or you may be surprised. You may be older and shopping for a first Holy Communion heart locket necklace for your child or godchild. Whatever your reason for shopping for this special piece of jewelry, you want to explore all of your options when it comes to style, design, and type of metal. First Communion is a very important time in a person's life. This is when a child takes on the vows godparents made on her behalf when she was a baby. The First Communion signifies the first step into adulthood and assuming responsibility for faith, life, and decisions. When choosing a locket, deciding on which precious metal to purchase is a personal choice and may be dictated by budget. Chances are though, the person you want to gift with this piece of jewelry will have certain preferences. Perhaps she doesn't like gold jewelry, and prefers the weight and look of sterling silver. These are things you should find out prior to shopping for your communion gift. You'll find styles crafted from yellow gold, white gold, and silver. There are certain iconic symbols and motifs that are automatically associated with Christianity and specifically, the first Holy Communion. There are many pieces of Christian jewelry you can use for various religious milestones. You may choose a heart locket that is inscribed with the words First Communion, opt for a simple religious symbol, or go with a plain locket. Chalice: The chalice Jesus the Christ used during the Last Supper was the first communion chalice. The symbolism can be found in many of the First Communion lockets and other pieces of jewelry. The chalice may have a dove (symbol of peace) diving above it. A cross is often etched on to the chalice. Cross: One of the holiest symbols of Christianity is the sacred cross that symbolizes the crucifixion and resurrection of Christ. Heart: The sacred heart of Jesus is often found in Christian medals and even lockets. The heart symbol is associated with the profound love of Christ. Some heart-shaped lockets have a cross engraved on the front. You can also find various designs that include a diamond or gemstone embedded in the center of the cross. Dove: A Christian symbol of peace, the dove, is also symbolic of the Holy Ghost or Spirit that is part of the God, Christ, and Holy Spirit trinity. Fish: The ancient symbol of the fish drawn in the dirt by persecuted Christians during ancient Rome is still a cherished symbol of the Christian faith. The fish represents one of Christ's many miracles, which is the story known as "loaves and fishes", when Christ fed a multitude of people from a five loaves of bread and two fish. Lamb: Another symbol of the Christian faith is the lamb. The lamb symbol was also an ancient Jewish sacrificial animal to God. You'll find this motif on some First Communion lockets. Vatican Jewelry: You may also choose official Vatican reproduction jewelry. The two heart lockets found on Catholic jewelry websites of the official Vatican Library reproduction are very popular. One is a red enamel heart locket and the other is an engraved cross on the face of the heart locket. Either locket makes for a very special and meaningful present. 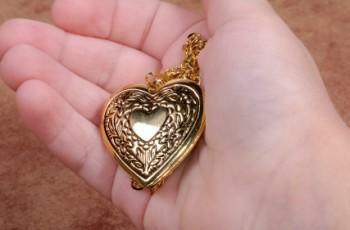 Prayer Heart Locket: You may find the filigree prayer heart locket the ideal choice. This locket is designed to hold a private prayer that can be laced inside the locket. Whichever heart locket you choose, you can have it personalized by engraving the name and communion date on the inside or back of the locket. A First Holy Communion heart locket necklace will always be a keepsake reminder of this important spiritual moment.